About Hawaii: The Hawaiians simplify all of this in one word: Aloha. In three syllables they say: Welcome. Warmth Kindness. Greetings. The most populous of the Hawaiian Islands, Oahu is also the most diversified. Home to Waikiki Beach, perhaps the most famous beach in the world, incredible hotels and enough shopping options to satisfy a power-shopper, Oahu's major tourist destination is filled with excitement. A short drive to the North Shore of the island offers a completely different experience. With its jagged cliffs and long, green valleys, this more tropical side of paradise offers such attractions as Waimea Bay, the Bonzai Pipeline, and the Polynesian Cultural Center. The cultural and economic center of the islands, Oahu must be experienced first-hand to appreciate its lure. With an almost ideal mix of great beaches, good weather, excellent golfing and just-enough nightlife and sightseeing options, Maui was rated "best island in the world" by Conde Nast Traveler Magazine's "1997 Reader's Choice Award" poll. 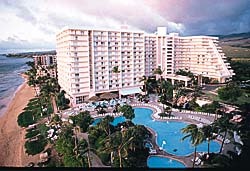 The island contain two primary resort areas; Ka'anapali/West Maui and Wailea/Kihei. Ka'anapali is a 3-mile stretch of white-sand beach bordered by 10 major resorts and at least 30 restaurants. Once home to a thriving commercial whailing port, the nearby town of Lahaina now provides additional shopping and dining options, as well as most of the islands' nightlife. North of Ka'anapali lie the resort areas of Kahana, Napili and Kapalua. The southern part of the island contains the resort areas of Kihei, Wailea and Makena. Residing at the base of 10,000 ft. Mt. Haleakala, these areas enjoy a quieter, more relaxed pace than Ka'anapali and contain some of the islands' best golf and tennis facilities. Northernmost and oldest of the eight major island, Kauai is, without question, the most beautiful of the Hawaiian Islands. Famous for its movi-set locations, (Blue Hawaii, South Pacific, Jurassic Park) the island abounds with a myriad of exotic flowers, scenic valleys, clear waterfalls adn majestic seacliffs. 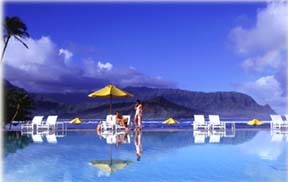 Kauai contains three resort areas. 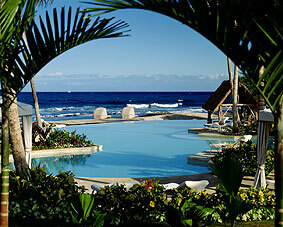 Poipu is located on the xouthern coast and offers the best weather on the island. On the islands' eastern coast, Kapaa and Wailua offer a variety of accommodations and contain most of the islands' shopping and dining options. Further north is Hanalei, with its famous bay (mentioned in the song, Puff the Magic Dragon), and the Princeville Resort area, known for it's extraordinary scenery and luch tropical surroundings. One of the few places in the world where you can see an active volcano, Hawaii is larger that all the other islands combined. Most of the resorts are located on the west side of the island (leeward or dry side), typical referred toa as the Kona Coast, which has two principle resort areas. The first, called Kailua-Kona, is a quaint village of restaurants and shops. There are only a few beaches here, and they usually disappear in winter. Approximately 25-miles north from Kailua-Kona, the Kohala Coast offers outstanding golf, white-sand beaches and the island's premiere resorts. The city of Hilo lies on the east side of Hawaii. This is the 2nd largest city in the state, with a population exceeding 50,000. Its cooler, wetter climate is ideal for orchid and antherium cultivation, and many botanical gardens are available for those interested. Hilo has few beaches but because of its location, is recommend as a starting point when visiting Volcanoes National Park. Sixth largest of the islands, Lana'i is located in the center of the Hawaiian island chain and is approximately 13 miles wide and 19 miles long. The island's name translates to "day of conquest", and like all of the Hawaiian Islands, is volcanic is origin. Roughly triangular in shape, Lanai's unusual beauty is most apparent in its contrasts; from sunny, white-sand beaches to rugged pine forests. The island of Lanai offers a primitive charm of its own along with a full compliment of warm friendly residents, currently around 2,500. The least developed of the major islands, Molokai is most like Old Hawaii. Here, life is unhurried and the beached are uncrowded. The western end of the island contains an Arican wildlife preserve, and the landscape resembles the Serengetti Plain of Africa. The eastern side of the island is lush and green, and the north coast contains some of the highest seacliffs in the world. The main resort area is called Kaluakoi, which is on the west side of the island, so it is dryer adn sometimes windy, but has incredible beaches and a very challenging oceanfront golf course. Climate: Exotic tropical. Winter average high 80F; summer average high 87F. Cooler at higher altitudes, and the average temperature drops about 15 at night. The trade winds blow at a remarkably consisten 15 knots, making Hawai'i cool and comfortable most of the year. Documents: The 50th state in the U.S.A. -- Hawai'i the Aloha State. Electricity: 125 volts/50 AC; U.S. appliances are compatible. Time: 10 Hours behind Greenwich Mean Time (-10GMT). Daylight Saving Time is not observed. Transportation:< A rental car provides the most freedom for traveling around the islands. Taxis are available on all the islands, but for longer distances they can be rather expensive. Be aware that demand for rental cars can exceed supply, so book early. The state has imposed US$2 per day rental vehicle surcharge tax. There is no waiting period, and the license is valid statewide for thirty days. The fee is $50 cash. Both partners must be over the age of eighteen. Birth certificates are not required, but a driver's license or other form of identification should be brought to the licensing appointment. If either partner has been married before, he or she will have to state the date, county and state (or country) in which the divorce was finalized for each previous marriage. The license also requires the names of each partner's parents and the places where they were born.